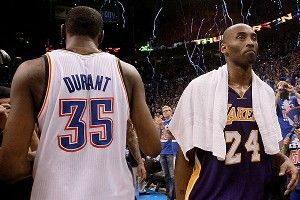 » Does Kevin Durant Have Too Much Kobe Bryant in Him? Does Kevin Durant Have Too Much Kobe Bryant in Him? Despite the Los Angeles Lakers’ irrelevance — the team has gone a dazzling 1-8 in second-round games over the last two years — the shadow of Kobe Bryant looms over the Finals. With five championship rings, he’s the aging embodiment of accomplishment, an icon of unapologetic individualism. During one televised broadcast, Magic Johnson suggested that Kobe would be “passing the torch” to either Kevin Durant or LeBron James after one of their respective teams took the title. And a week ago, Kobe called Durant a “6-foot-11 me,” which is the nicest thing he can say about anyone. Even though Kobe is on the downswing of his career, he remains a convenient tool for comparison in all areas related to competitive fire. For several years, basketball punditry has insisted that LeBron needed to be more like him. Such claims weren’t based on addressing any tangible weaknesses — like, say, the benefit of developing DoberMamba-esque mid-range lethality — but were critiques of his character. In superstar genetics, LeBron was seen as possessing the same double helix as Oscar Robertson or Scottie Pippen, all-around performers who lacked the mutation that demanded “Flight of the Valkyries” be played whenever they stepped on the hardwood. LeBron’s failures, it was repeatedly said, stemmed from the heart. Durant, by comparison, came from the same steely lineage as Kobe and Michael Jordan. They are fearless competitors with a thirst for victory that can never be slaked. To such gods, the idea of another man taking the final shot was heretical. Prior to the Finals, one common take was that Durant would inherit Kobe’s role as the coldblooded winner, with LeBron remaining a talented loser, forever thwarted by his own lack of confidence. It was all a bit premature, considering Durant has never won anything. As a parade of stat dweebs slithered forth from damp laboratories with proof that Kobe’s crown was constructed from selective memory foam, there was a shift in the way “clutch” gallantry was perceived. The phrase “hero ball” is now synonymous with selfishness and inefficiency. Once an insult of choice for John Hollinger and other proponents of advanced metrics, it’s been mainstreamed. After the Thunder dropped Game 4, even Kendrick Perkins indulged. “Hero ball is exactly what we were playing tonight,” the crabby center grumbled. This is a victory of science over faith, Copernicus recognizing that the universe does not revolve around contested jump shots. It’s a good thing. While a more measured interpretation of late-game performance is nice to see, the idea that certain players possess a mystical Will to Power still hasn’t been exorcized. No matter what numbers say, people want to believe success is dependent on wispy, spiritual qualities instead of commodities like size, strength, or speed. There’s nothing romantic about a dweeb clucking that Dwyane Wade only makes that 3-pointer at the buzzer 22 percent of the time. For those who worship at the altar of clutchness and heart and killer instinct and will to win, Durant is the new deity to prostrate oneself in front of. Through four games of the Finals, Durant has been Kobe-esque in the worst sense. He’s averaging 30 points a game, on 55 percent shooting (just for the sake of argument, we’ll pretend that Kobe is that efficient). But in the Thunder’s three consecutive losses, Durant has totaled 11 rebounds and four assists. One more time: He’s amassed 11 rebounds and four assists in three games combined. And unlike Kobe in his prime, Durant doesn’t stop anyone. After checking LeBron led to foul trouble, he was assigned the task of stifling Mario Chalmers, the scoring dynamo who contributed five points in the prior two games. In Game 4, Chalmers poured in 25. The unimpressive numbers reflect what we’re seeing on the court. Durant isn’t getting teammates easy baskets, earning extra possessions on the glass, or preventing opponents from scoring. He’s simply not contributing enough. And, unfairly, people are going to say that he lacks experience or determination or some other fictitious attribute. But it’s not about that mythical Nietzschean superman gene. Durant just isn’t as good at passing or rebounding or defending as he is at scoring. This season, the most assists he had in a game was eight. LeBron had that many in the first half of Game 4. If the Heat close out the Thunder, we’ll enter a furious spin cycle where LeBron’s most fervent detractors will claim that he was victorious because he changed. He matured. He stopped krumping and developed a detached million-yard stare. This time, he truly valued playing for a championship (unlike before, when he feared a shiny ring would attract more hungry seagulls to his yacht). In short, get ready to watch a bunch of people who were proven wrong belch, “I told you so.” But the Heat aren’t winning because LeBron James is playing like Kobe Bryant. Instead, the Thunder are losing because Kevin Durant is.